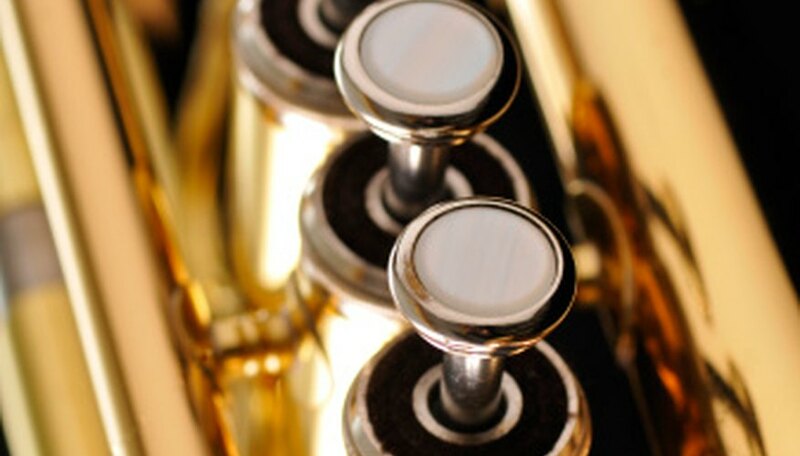 Most trumpets are B flat instruments, meaning that a "C" note played on a trumpet sounds like a concert B flat. To compensate for this, music for a trumpet is transposed up one note to match the "C." The guitar is a C instrument, meaning that it plays a true concert pitch. There are C trumpets available as well. Thus, if you play a C trumpet you won’t need to transpose guitar cords and trumpet notes for them to be in the same key. Look at the musical notation and identify the key, right by the clef at the far left of the manuscript paper. Make sure to keep the key in mind when transposing the music. A sharp next to a note means it is raised half a step, and a flat means it is lowered half a step. Look at the trumpet note and lower each note one full step to match the guitar notes. Transpose the guitar music up one octave (that's eight full steps) so that it matches the tone of the trumpet. The guitar sounds one octave lower than the trumpet when played. All notes are separated by a whole step, except between "E" and "F," and "B" and "C." Flats and sharps change this, so watch the key.